Hire Abbey Road: The Complete Beatles Show for a Corporate Event or Performance Booking. The British Invasion" is back with the sights and sounds of Abbey Road. This is Connecticut's only Beatles tribute band. Without the use of tape machines, they are able to reproduce the music that forever changed the course of modern music. 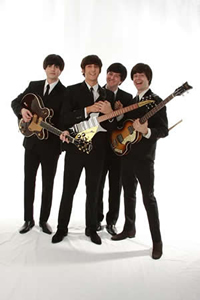 All the members use the same authentic instruments that were used by John Lennon, Paul McCartney, George Harrison and Ringo Starr to recreate the look of the Beatles. A fifth member of Abbey Road was added to create, with the use of synthesizers and samplers, the lush orchestrations, which were prominent in the later compositions. In addition tot the instrumentation; Abbey Road also recreates the distinct looks of The Beatles through three costume changes, which encompass the Ed Sullivan Show appearance to the Sgt. Pepper's Lonely Hearts Club Band Album to the Let It Be rooftop concert. Besides the music of The Beatles, Abbey Road also explores the some of the solo efforts of Ringo and McCartney.. Learn how to hire Abbey Road: The Complete Beatles Show or research availability and pricing for booking Abbey Road: The Complete Beatles Show to perform at a corporate event, fundraiser, private party, social media campaign, fair or festival, tradeshow or conference, endorsement project, or hire Abbey Road: The Complete Beatles Show as a guest speaker, please submit the form to our agency. Frequently Asked Questions about booking Abbey Road: The Complete Beatles Show. Is Abbey Road: The Complete Beatles Show available to work my event? Abbey Road: The Complete Beatles Show's current work schedule and location in relation to your event's type, date, budget, and locality will play a primary factor in the acceptance of booking Abbey Road: The Complete Beatles Show for your party. As long as your funding is commensurate to the price range to book Abbey Road: The Complete Beatles Show, CTI will propose your event to the official agency representing Abbey Road: The Complete Beatles Show. After we consult with them, we can circle back with you to provide a personal and accurate quote that includes: final costs, availability, and actual interest in being hired for your specific event or party. How much is Abbey Road: The Complete Beatles Show charging for events? CTI can give you the Abbey Road: The Complete Beatles Show booking price once we submit your event details to their camp. "How much does it cost to book Abbey Road: The Complete Beatles Show for an event?" is a frequent question we get, but the final Abbey Road: The Complete Beatles Show booking price is contingent on many variables and the booking fee we show is based on a range derived from our past experience with what will Abbey Road: The Complete Beatles Show charge for an event. Also, thier speaking fee might be different than the fee shown for the cost to perform or to just appear. Popularity, career stage, along with current demand will cause fluctuations in their speaking price too. The final booking price may be more than what is shown, but you should at least have a budget within that range for them to consider an appearance, performance or speaking engagement. How do I contact the Abbey Road: The Complete Beatles Show agent or manager? CTI negotiates on behalf of professional event planners and talent buyers for paid appearances! We cannot give out direct contact information of the Abbey Road: The Complete Beatles Show agent or help distribute fan mail, personal messages, gifts, requests for free appearances, or donations of time. The Abbey Road: The Complete Beatles Show manager and agent will only work with us if we present them with funded offers for their client to work your event. Can I book Abbey Road: The Complete Beatles Show for an event at a price less than shown? There is low probability to book Abbey Road: The Complete Beatles Show for a party with anything substantially less than the published booking cost price range. We will negotiate with the Abbey Road: The Complete Beatles Show agent on your behalf, but if your funding is not in place then it will more difficult to book Abbey Road: The Complete Beatles Show, because they get many offers to work events that are at or above asking price. It is also important to consider the travel costs when researching the Abbey Road: The Complete Beatles Show booking fee, as additional expenses like this, as well as an entourage of staff and equipment, are not necessarily built-in to the booking fee range shown. If your budget does not factor that in, then there is no benefit for them to want to be hired. We do not personally speak for Abbey Road: The Complete Beatles Show, but in our experience in booking talent for over 25 years, this is generally the outcome of inadequate funding. CALL US TODAY (760) 729-2000 and speak with a CTI Abbey Road: The Complete Beatles Show booking agent to get direct availability and pricing for having this talent to work your event. With almost 30 years of industry experience working with professional event planners and talent buyers like you, we can successfully work to hire Abbey Road: The Complete Beatles Show for a corporate event, personal appearance, corporate entertainment, speaking engagement, endorsement, private party, or wedding. For complete information on booking Abbey Road: The Complete Beatles Show for projects like branding and promotional marketing, product or service launches, print advertising campaigns, media events, fundraisers, social marketing campaigns, and a guest appearance on TV/Movie specials including, documentaries, infomercials or voice over in video games, please call us at (760) 729-2000. CTI will contact the Abbey Road: The Complete Beatles Show agent, manager or representative on your behalf to inquire about the current Abbey Road: The Complete Beatles Show booking fee and availability, while negotiating the lowest cost on your behalf. Choose CTI as your booking agency for Abbey Road: The Complete Beatles Show to hire at corporate events, conventions, trade shows, business retreats or for television and radio commercials, voice overs, and charity events. Be advised that the Abbey Road: The Complete Beatles Show booking price may drastically change based where spokesperson campaigns, speeches, fairs and festivals; and even a shoutout, birthday party, or private concert is located when factoring domestic or international travel. CTI agency will help book Abbey Road: The Complete Beatles Show if the buyer has the budget and if they are interested in the event. CTI can also assist on the production requirements for Abbey Road: The Complete Beatles Show, when needed.